Redemption on the River is set up and down the Mississippi River in 1848, and features Silas, our main character escaping dark problems on the farm at home and looking for redemption and a way to make things 'right'. Silas learns how to gamble, use a knife, falls in love, makes a best friend - a giant of a man named one-ball - and all this against a background of slavery. Big steamboats, big stakes at the faro gambling tables and lots of danger make Redemption on the River an exciting and action packed read. 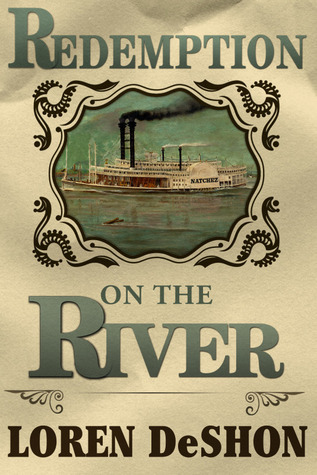 The only other book I've read set on the Mississippi is Huckleberry Finn by Mark Twain, and interestingly, I found out afterwards that it was set in 1845 (around the same time as Redemption on the River) although published in 1884. Now, while I didn't enjoy Huckleberry Finn (2 stars), I'm pleased to say I enjoyed reading Redemption on the River, and the book even permeated my dreams. I had several dreams about boats on the river while I was reading it; the sign a book is getting to you! I recommend Redemption on the River by Loren DeShon to those who would like to know more about this era, life on the Mississippi in the time of steam boats, and the gambling lifestyle that went on, also made famous by the 1994 movie starring Mel Gibson, Maverick. I have read this book! I really enjoyed it too. It's such an adventure I couldn't put the book down. I liked having the historical notes at the back so you can really see that most of this book actually happened, and it makes you think. Glad you enjoyed it, and I liked the historical notes at the end too. Thanks for stopping by.